Bucks County Designer House Process: Inspiration Board Reveal! Not every design element should be included on an inspiration board. I like to present only the major items, or representations of those items, along with colors, and fabrics. Otherwise your board runs the risk of becoming too busy. Well, we’ve finally arrived at the stage of bringing all the Sunroom’s design elements together. Usually I try to incorporate my floor plan into the board, and then spiral the main furniture items off the centrally located floor plan. This allows for easy viewing and simple communication of the design. In this particular board, I also included my watercolor perspective drawing. This helps the viewer visualize the space even further. 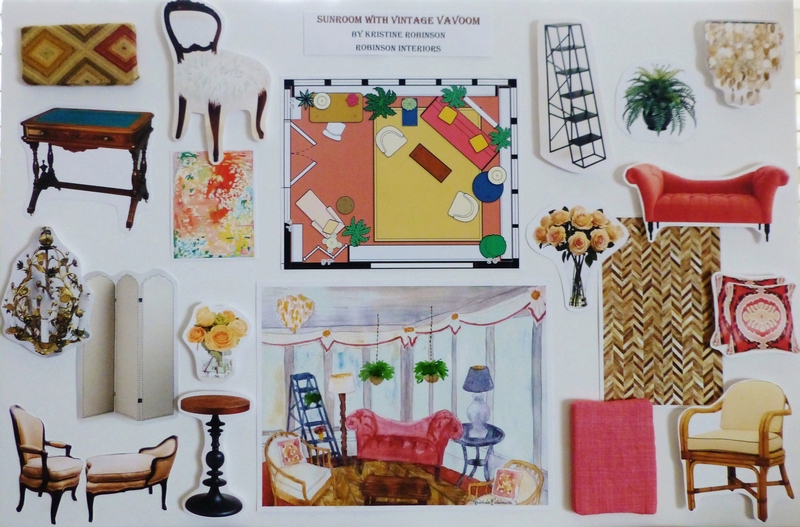 My designer’s inspiration board for the 2014 Bucks County Designer House Sunroom. This helps others visualize my plans for the space. Adding texture to the board, by including fabric & trim samples is always helpful. On this board I included some raised effects to add a layered look. This was achieved by inserting a spacer behind some of the images to raise them off the background of the board. It’s also important to note: An inspiration board is just that–inspiration. Items shown on the board will likely change as plans evolve. The board is just for sharing the initial vision for the space. Part of the fun in designing a room, is allowing yourself the space to develop new ideas as opportunities arise. If I’m out shopping and see something that’s perfect for the sunroom, I’d be a fool not to add it, right? So the board is just a tool to communicate your early ideas for the space, before the real work begins. It’s always really interesting to see how the finished room actually differs from the inspiration board. What do you think? Did this board help you visualize the Sunroom in more detail? Can you see it coming together? I already notice a few changes…slight differences in my window treatments, for one. And I know the space behind the settee will be different too–I’ll share that new little tidbit with you soon! Make sure you take the time to post a comment and let me know what you think about my plans for this room. I LOVE to hear from you! And please, tell everyone about Kristine Robinson's blog. I need all the friends I can get! This entry was posted in Color, Decor, Designer House, Furniture, Interior Design & Decorating and tagged Bucks County Designer House, Decorating, Design, design board, inspiration board, Interior, Interior Designer. Bookmark the permalink.